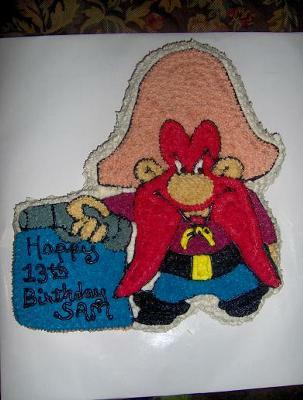 This Yosemite Sam cake is what my son wanted for his birthday. He just turned the big 13! I used 1 boxed mix in the shaped pan and baked according to directions. After it cooled I placed it on the board. I used buttercream icing, and I used round and star tips. I couldn't find the directions on the Wilton site, this is a retired pan. So I googled pictures of Yosemite Sam and just did what I thought it should be.